Do McDonalds resturant have thier own aircarft. I remember being told about it but I searched the internet and found nothing! Is there true or not? Is there a website for it anywhere- anyone know where it is now or got a photo? Of course RM would only put in a DC-3 link. Yet another proof of the DC-3's versatility! LOL- I been inside that McDonalds DC-3 in Taupo in your pic radarman, but it aint the plane I'm talking about. The one I'm looking for is a jet aircraft....anyone know anything? I looked around but didn't find one, that doesn't mean there isn't one somewhere. That is indeed true Tailhook. That is 10 sheep to every person! good god a reason to go to a MacDonald's? Yeah thats a reason to go - if only it was a flying Mcdonalds restaurant. Holy crap earthqu8kes, I think you found it! The photos from airliners.net so it'll be real. 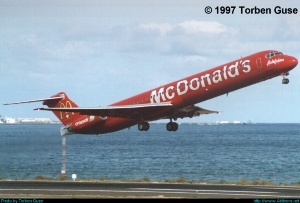 Well people, after a little bit more research I can confirm it's true- there is a mcdonalds jet airplane! Infact it is called the 'McPlane' and it is a MD-83 operated by Crossair of Switzerland! Heres a picture I found of it and you can see the Swiss Cross below the M on the tail and the word cross air written on the engines! LMAO- I want one for fs2004! hmmmm.... is there a download for it anywhere, i can't seem to find one. That plane is awesome though! WHOA i accidently put two posts in!!! How did that happen?? im so frustr8ed cuz i cant download the mcplane. 2 many people r logged on right now ugh! So what is it just an advertisement for McDonalds like the Ryanair plane that was given a Jaguar cars repaint? Great screenshots cheekytrolly, I'm glad it worked!